Violet Oil is one of the first herbal infused oils I ever made...my first apprenticeship was with Tonya Lemos at Blazing Star Herb School, and was extremely grounded in the Wise Woman Tradition. So, naturally, Violet was a big player in my formative years of herbalism- a beloved weed! Oil of choice- Olive, Almond, Grapeseed, and Jojoba are nice choices. My favorite is extra virgen olive oil. Finely chop your plant material. Make sure both the violet and your jar are completely free of any moisture- the enemy that can lead to moldy oils! Of course, there is the water content present in the plant to contend with (which is why fresh oils shouldn't be steeped for much longer than a week), but what I mean here is make sure the leaves aren't wet from dew, recent rain, etc, and that your jar is dry. Find a glass jar that fits it, so that the jar is completely filled-up to the top with the chopped-up violet. Loosely, yet firmly pack your jar. I like to gently tap the jar on the counter while I do this part, so the plant material settles itself in. Next, add your oil of choice. Pour until it comes right up to the very top if your jar. Stir it with a wooden chopstick to remove air bubbles, and add more oil if necessary. Place the lid on it, label, and then place it out of direct light in a place with stable temperatures. I also like to put a washcloth beneath it since, with this method, some oil may seep out of the jar. But this is the point! Mold is aerobic and needs oxygen to thrive, so reducing the airspace in your jar greatly diminishes your chances of your oil going moldy. Strain in about 1 week. Store in the fridge to promote a long shelf-life. Otherwise it will last about 6 months to a year unrefrigerated. 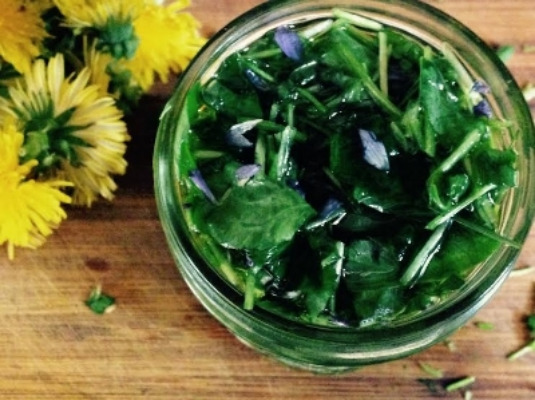 Violet leaves and flowers in a Wild Salad- a great way to get Violet into your diet. Cold-infused Oil such as this can be used as a base for many herbal products- Salves, Creams, Bath Salts & Body Scrubs, to name a few. They are for topical use only. Medicinally, Violet is famous for its ability to stimulate and move lymph. The lymphatic system is an important part of our immune system, and exciting brand-new research has now found lymphatic vessels linking the lymphatic system and the central nervous system! It runs parallel to the circulatory system but, unlike the circulatory system, the lymph system has no pump (the heart!). So anything we can do to help move the lymphatic system along is a big help. Some areas particularly full or lymph nodes and prone to stagnation are the breasts, the under-arms, and the groin. Lots of movement and exercise helps greatly, as well as taking lymphatic herbs internally, and applying lymphatic oils externally- which is how I'll use my violet oil, probably in the form of a salt scrub. Violet leaves, stems, and flowers and also edible and can be enjoyed in a "Wild Salad"- 1/2 Salad Greens, and 1/2 Wild Greens! circulating white blood cells, part of the immune system, which fight infection. Violet is an incredibly abundant wild weed here in our northeast bioregion. Take the time to get to know her and use her in your medicine and in the kitchen- you won't be disappointed with the results! "Missing link found between brain, immune system-with major disease implications"